Last fall I was all about the deep wine colors, as you can see here, but this fall: it is all about the emerald, baby. Dark emerald, that is. 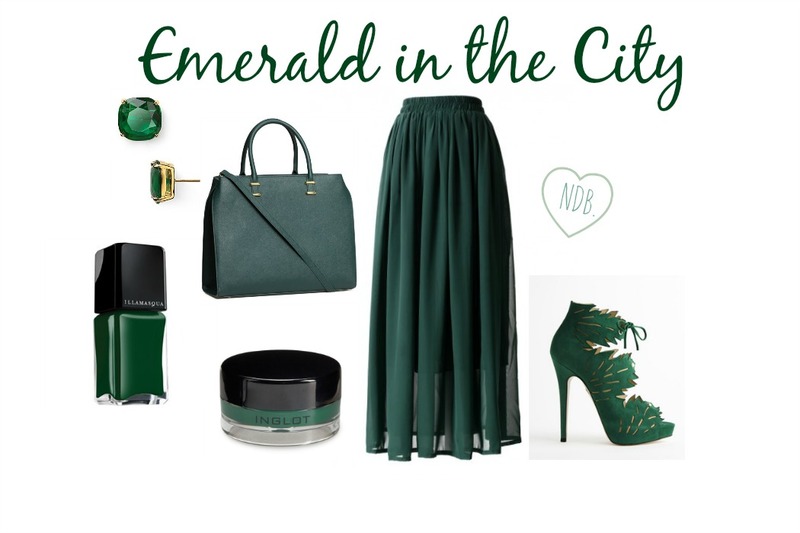 During New York and Paris Fashion Week, designers near and far revealed their Fall 2014 collections, and emerald seemed to be a color many designers had in common. Jason Wu, Altuzarra, Narciso Rodriguez, Prabal Gurung, J. Mendel, Stella McCartney, Elie Saab, and others had their models strut down the runway donned in this sultry dark color (does this color remind anyone else of Slytherin?). If you are determined to find a way to spice up your fall look with dark green colored pieces, but you can’t afford to purchase outfits off the runway, these pieces are where you should start. Emerald Maxi Skirt | One of the easiest ways to look put together and feminine is by wearing a chiffon maxi skirt. Not only does it look very feminine, it also looks great on everyone, it’s easy to style up or down, and it is very comfortable. This deep dark green color is perfect for the fall and wintertime because it is still bold, but it is not bright like something you would wear in the summer. I’m all about deep dark colors (like the color of my soul) during the fall, and this shade of green is making me very excited for the upcoming colder months. Dark Green Booties | The leaf cut out booties above are just so stunning! I love booties during the fall because they go with practically everything and most of them are comfortable to walk in. These, however, are gorgeous because of the cut out detailing, which is another thing I am loving at the moment. Combine the two, and I’m in shoe heaven! Dark Green Structured Handbag | I love a good structured handbag– it looks so classy and sophisticated. Although black and white ones are good staples to have in your collection, sometimes it is good to add a little bit of color in your life. I think everyone should have at least one statement handbag for the different seasons, and a dark green one is perfect for fall/winter 2014, especially if you wear a lot of darker colors. Emerald Studs | A girl can never have too many earrings, and studs are a must in any earring collection. These emerald studs are bright and bold, but still classy and elegant, which will pull together any outfit. Whether you like them big or small– still talking about earrings here, people– get your hands on some for this upcoming season. Dark Green Nail Varnish | So in the summer you were rocking hot pink and orange nail polish. Now, it’s time to rock some emerald green nails, ladies. If you’re a nail polish junkie like me, you definitely need a dark green shade. The color is great for the colder months when you want to rock something darker on your nails, but you don’t feel like wearing black. It will look beautiful on any skin tone and if you feel like jazzing it up for the holiday, just add a glitter top coat! Emerald Eyeliner | Blue eyeliner is all the rage at the moment, and I myself have been wearing it quite a bit, but I think it is time to venture out a bit into the land of other colors and try creating some looks with dark green gel liner. Gel liner is great because it’s so easy to use–all you need is a good eyeliner brush. If you have brown eyes like me, this is something you definitely want to try out. I definitely get bored of having brown eyes, and green colors really make brown eyes pop so give this look a try! What do you think about the dark emerald green trend? Are you going to be picking up some items in this shade?